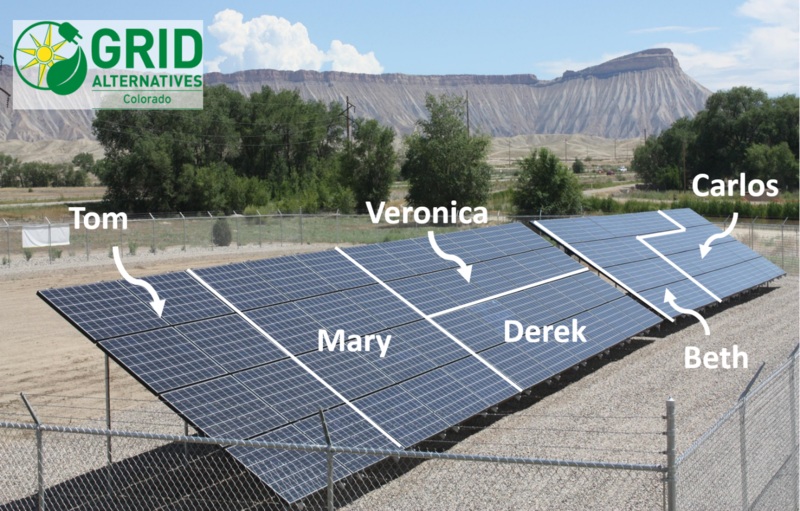 Through our community solar program, GRID Alternatives Colorado is expanding access to the benefits of solar for families living with low or fixed incomes. GRID, in partnership with cooperative, municipal and investor-owned utilities, is developing the first community solar arrays in the country that exclusively benefit underserved communities, as well as collaborating with for-profit community solar developers to help ensure that the energy generated by their community solar systems are accessible to all. Rooftop solar is the most common way for individuals and families to go solar today, but over three-quarters of the country isn’t able to participate in rooftop solar because they rent their home, don’t have a solar-appropriate roof (shaded by a tree for example), or just can’t install rooftop solar for any reason. Community solar is a way for anyone to go solar. Participants get the financial savings and clean energy from the sun as if the solar system was on their roof, but their solar panels are located offsite in a larger, shared community solar array in an area that’s ideally suited for solar energy generation. With community solar, the panels are not actually on your roof. Your panels will be located on a larger, offsite community solar garden close to where you live. From 2015-2017, Colorado Energy Office and GRID Alternatives partnered with utilities to offer community solar at no out of pocket cost to Colorado families with household incomes at or below 80% of your Area Median Income (Income Limits), and reside within the appropriate utliity service area. In addition to saving households money every month on electricity bills and protecting you from rising electricity prices, community solar provides clean energy and a healthier environment for all our communities. Ready to find out more? Please have a look at our current community solar projects and partners and the application process below. Think you might qualify? Please contact our Outreach department at 303-968-1326 or email us at outreachco@gridalternatives.org to arrange a preliminary phone screening! If, after the pre-screen it looks like you will qualify and we're currently offering community solar in your area, the next step is to proceed with a formal application. Please feel free to give us a call or send an email for more general information. Poudre Valley Rural Electric Association's Coyote Ridge Solar Garden is still accepting applications! System Size: Total size is 1.95 Megawatts with 500 kW allocated to nonprofits and 700kw allocated to low-income qualified residents. This is the largest allocation of solar for low-income households in the county.